What I love about this card is how simple it is, yet it's still a fantastic card. Jacque's turned it up by using a different fold (yep Jacque I'm pretty sure it is a Z fold). That's another thing about stamping, you can make a card sweet and simple or go all out - it's completely up to the designer (or CASEr in my case) and there are no rules. Visit Jacque's Blog Stamp Happy NZ to see what else she's been up to. This is a card from Tracy Jackson's blog "Stamping All Seasons"
I think this is a fab colour combo and one not usually seen with this set, but it definitely looks great. 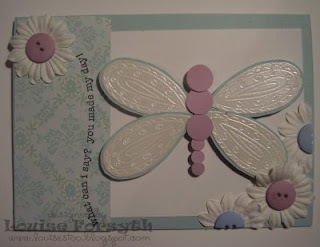 Tracy has loads of great cards and layouts on her blog so make sure and go and check it out. I'm sure you'll all agree with me that this one SOO deserves to be an inspiration post. It's simply gorgeous. 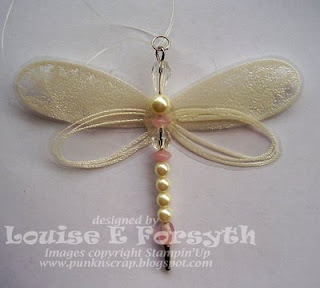 Louise has used her Pretties Kit to make this dragonfly. I'll definitely be giving this project a go in the near future. Visit Louise's Blog by clicking HERE. Once again I was blog hopping yesterday and I hopped onto Rachael's blog. She had this beautiful LO posted, and isn't her little girl just beautiful as well?? Rachael's Blog has just been added to our links list so go check her out. Kim's big on sponging and has got me into it more as well. 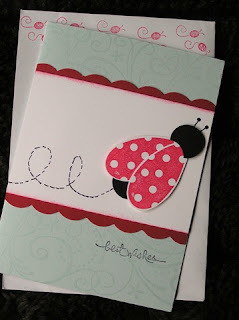 She used sponging on this card and it looks fantastic! Checkout what else Kim's been up to, she's been busy, on her blog INKin Fun. Isn't this just gorgeous?? I still don't think I've seen an actual flower made with this set, but that just shows you how versatile it is. Louise has made this stunning dragonfly and used a sketch challenge - for more details check out her blog HERE. What do you think of the new links list??? I've added the new one so that you can see instantly who's updated their blogs recently. It also show up who's been slacking. Hope this saves you a little time blog hopping and encourages those who haven't updated in a while. Hope you're all keeping warm & dry - a perfect night to stamp! Here's my entry for the colour challenge. It didn't come out quite how it looked in my head, but I think it's ok, a little more green than I had intended. Sorry I've used Stem Silhouettes, but it's one of my favourites, shame it's retired, it could easily be substituted with Artfully Asian but I don't have that set - yet. 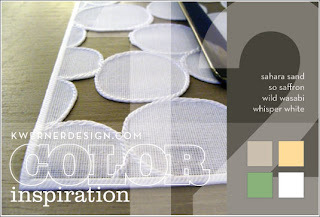 The layout was CASEd from a card I saw a while ago on Amber Hight's Blog. I've seen so many fantastic cards using these colours and cards from K Werner's other challenges. She's so talented at putting together great colour combos. Here's her current Colour Challenge. 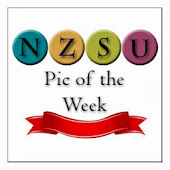 Have fun with it and email me with your cards with the subject NZSU CC 1. Don't forget - this is the LAST week to enter in for blog candy. Leave your comment and go in the draw. This gorgeous creation comes direct to us to us from Sharlene Meyer's blog "Magpie Creates"
I love this set, and from what I understand from alot of your blogs so do you, I love that this is so simple and still so effective, and only uses two colours.... sweet. 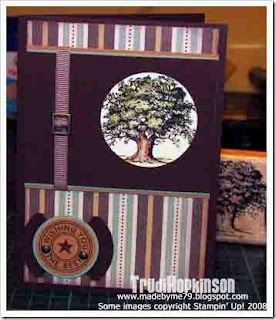 Here's a card and a layout by Anne Marie for the June challenge of doing a 'masculine' project. She's done a fabulous job with both. She's also been busy making some bright and colourful children's cards you can check out on her blog Stamping Galore. Sorry my computer's playing up so will try and publish the card in the morning. And sorry Anne Marie that's it's taken me so long to get them published. Here's Anne Marie's card that she made for the challenge. Accessories - Twill Tape, Hodgepodge & corner rounder punch. Louise has captured both in this lovely LO. I love the colour combo she's used and her use of hodgepodge and it works for our June challenge! Check out more of Louise's creations on her blog PunknScrap. Yay we've had over 5000 hits! I thought I'd let you all know that we're averaging over 120 hit's per day with yesterday a high of 206!!! Hopefully many of those who visit here are then browsing the blogs listed. Thank you to everyone for sharing your creations and inspiring people. If you're an NZ SU demo or SU customer with a blog and you want it linked on this blog, just email me with your details and I'll add you to the links list. And remember ANYONE can take part in our challenges. Keep your cards, LOs, 3D items etc coming, we love seeing them!! And for those who haven't commented on this blog yet, there's still plenty of time to go in the draw for the Blog Candy. I came soo close to ordering this stamp set the other night - definitely next time! This set is just perfect for the technique that Kim's used. Check out her blog INKin Fun to see what she's used. Isn't this card just stunning what more can I say? 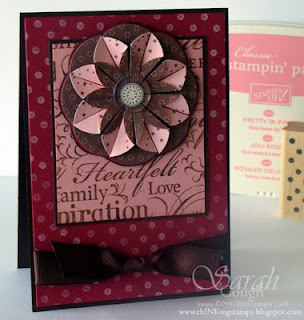 For full details on how Sarah made this card, check out her blog thINKing stamps. Isn't this the cutest card? So far I don't think Michelle's actually made a flower with this stampset but I love what she's done with it all the same. 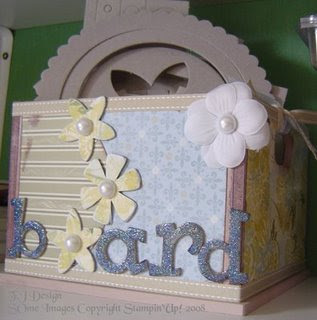 For more details and to see the matching box check out her blog O 2 B Stampin. I love the colours and check out that stunning background effect. Also did you know that that Keryn is on the Design Team for " Daring CardMakers"? Talented or what! I had 5 minutes for a cuppa and a blog hop this morning, and wanted to share this gorgeous scrapbook page by Michelle. I've been using Baroque Motifs a lot lately, and this caught my eye right away. Love the rub-ons on the photo! 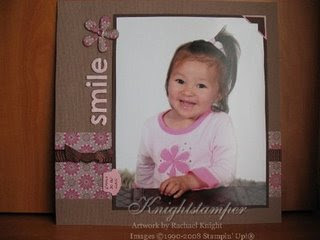 To see more of Michelle's work, please visit her blog O 2 B STAMPIN! I saw this on Tracy's blog this evening (ok not really evening, it's almost 11.30pm) and had to post it straight away as an Inspiration project. It's such a great project, the colours and use of the clip board look fab. Check out the details on Tracy's blog Stamping All Seasons. Here's Karen's wonderful entry. I love the effect she's achieved using different letter stamps. And before I go to bed, here's my entry. I'm thinking Lovely As A Tree will be popular with this one.